On a recent trip to western New York State, we made a cool discovery. 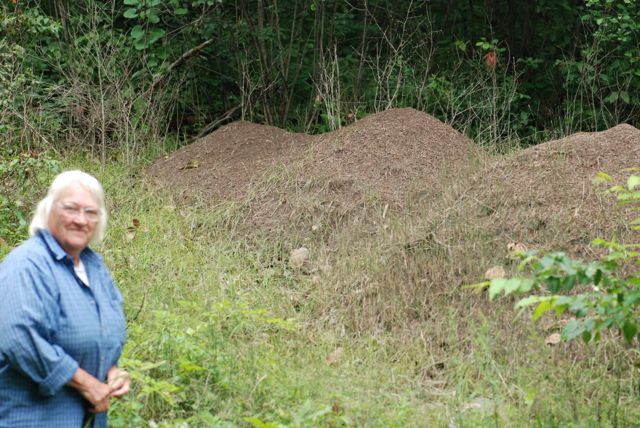 Driving along a quiet country road, we came upon some huge ant mounds. It’s hard to tell how big they were until someone plays spokesmodel. but more than twenty of them. In the photo the size is a bit deceptive because the mounds were up on a bank along the road. However, they were still relatively massive. Most of them were at least two feet tall. 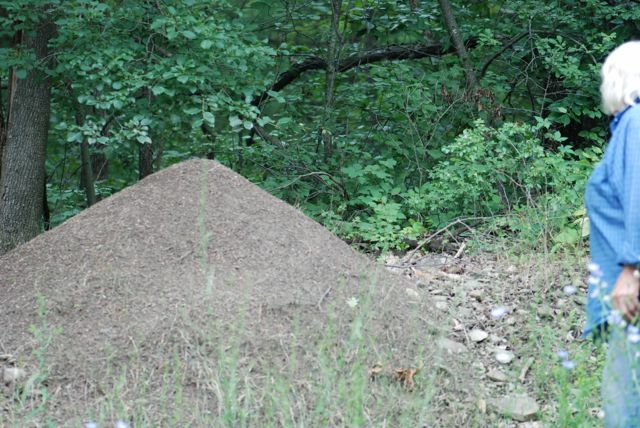 These impressive structures were the nests of the Allegheny mound ant, Formica exsectoides. 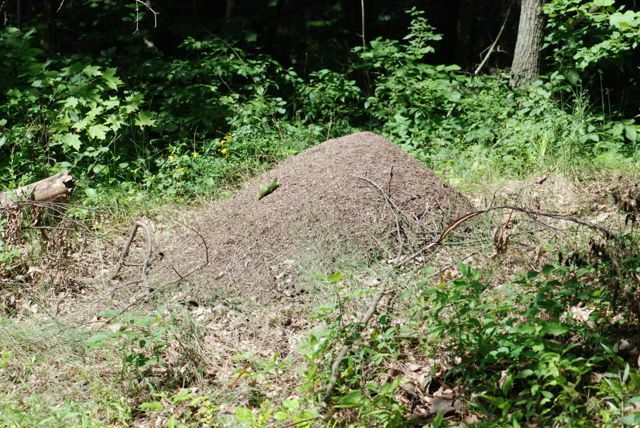 Each of the mounds was covered with many active ants. According to the literature, the colonies have multiple queens and split up via fission to form clumps of interconnected mounds. 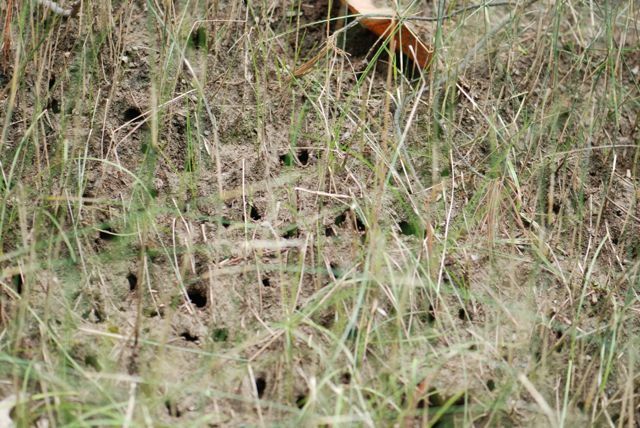 The mounds are thought to help the ants regulate the temperature inside the nest, which in turn optimizes the development of the young. Doing some comparisons, it looked like the top of each mound was clear of vegetation and the upper surface was relatively uniform. 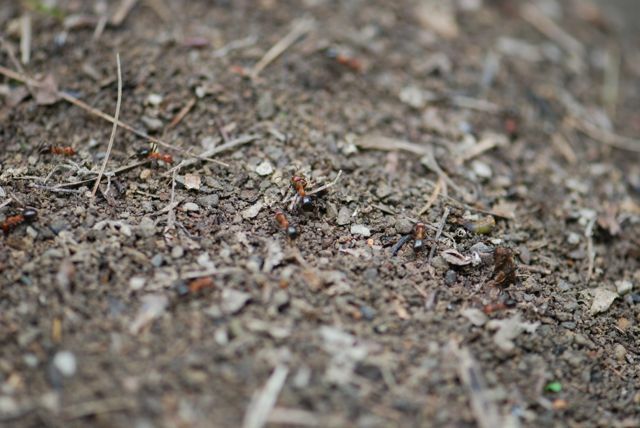 This photograph shows a closer view of some ants working on top of the mound. Lower down, the mound was covered with sparse vegetation and riddled with holes like a sponge. It would be fascinating to know whether these were for drainage, air circulation, or what. Checking out the lower holes, we found they did serve as entrances and exits. One contained a myrmecophile, although it moved away so fast I couldn’t tell if it was a beetle or roach nymph. The ants were very active. It didn’t take long to find a nearby foraging trail. 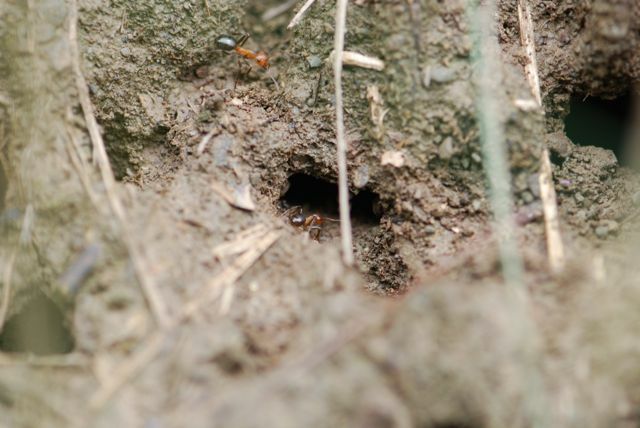 Compared to a similar-sized foraging trail of our Arizona Pogonomyrmex harvester ants, it was noticeable that these ants weren’t carrying anything. Because they are known to feed on insects, as well as gather honeydew, they must process their food in the field. Anyone know more about their foraging behavior? 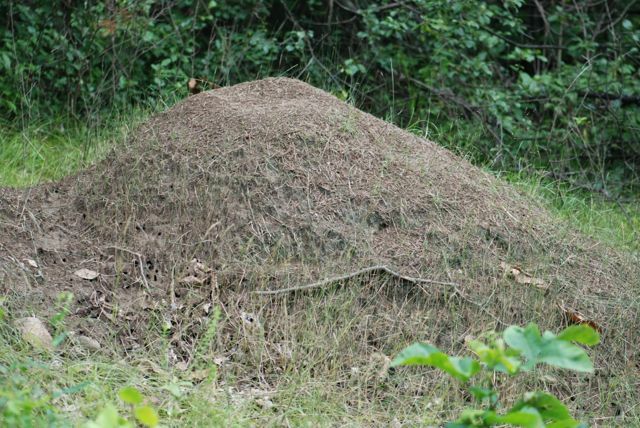 Even to people who aren’t interested in ants, these mounds were such a presence that they inspired awe and curiosity. It would be great to get a chance to study them longer. 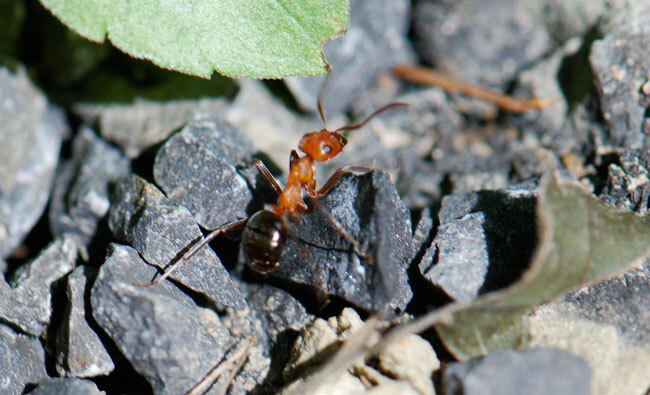 Have you ever encountered Allegheny mount ant nests? Very cool! Hard to imagine there would be enough food for all of those ants within the immediate foraging area. Yes, it is rather hard to imagine. It’s a protected area, so the forest is in a natural state. Aggregations of scales, planthoppers, and aphids near these nests are often thriving under the protection of these ants, and others like them that never seem to be carrying any food, such as Formica ulkei, F. obscuriventris, etc. 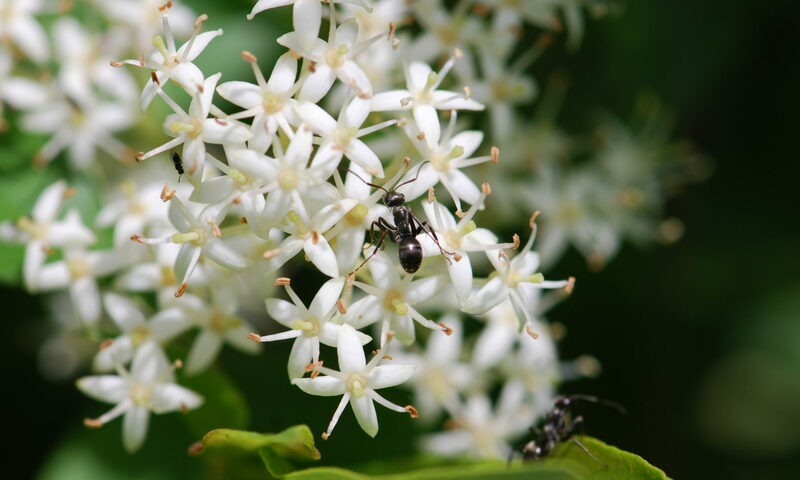 It would be good to see a careful analysis of returning foragers’ crop contents, as well as a study of the nutritional ecology/physiology of these ants, to better understand the quandary you have posed.